Despite the hustle and bustle of everyday life, residents walked for freedom, justice and unity last week, illustrating the values civil rights activist Martin Luther King Jr. demonstrated more than 50 years ago. Moments that define a community appear in a variety of ways, one of which revealed itself on Kings Highway in Haddonfield on Jan. 15. Despite the hustle and bustle of everyday life, residents walked for freedom, justice and unity last week, illustrating the values civil rights activist Martin Luther King Jr. demonstrated more than 50 years ago. The Haddonfield Human Relations Commission, an organization formed 22 years ago to protect the rights of community members, created the tradition of walking up and down Kings Highway on Martin Luther King Jr. Day to pay tribute to the man who gave up his life to stand up for equality. On the evening of Jan. 15, Haddonfield residents processed down Kings Highway with candles in hand to walk for freedom and remember the man who inspired a nation to love the world in variations of color, instead of casting judgment and only viewing life through a black and white lens.This nine-year tradition will continue to connect diverse members of the community for years to come, according to Human Relations Commission Chair Ellen Stone. Commissioner John Moscatelli and Mayor Neal Rochford attended and participated in the annual walk. “It is a wonderful remembrance of a great man who served our country well and taught us to bring us together rather than apart,” Rochford said as he stood in front of Borough Hall before the ceremony. During the awards portion of the ceremony, three Haddonfield Memorial High School students were recognized for their creative ability to express feelings on freedom and equality in society today, receiving awards from the HHRC. An art contest was also held among each of the elementary schools. Emma Lisiecki, fourth-grader at Elizabeth Haddon, was recognized for her artwork. During the ceremony, the Human Relations Commission introduced a pledge book for residents to sign. The book, a pledge to protect the community’s diversity and reject acts of divisiveness, is located at the Haddonfield Public Library. The commission hopes to donate the signed book to the Haddonfield Historical Society after more signatures are gathered, making it part of Haddonfield’s history. 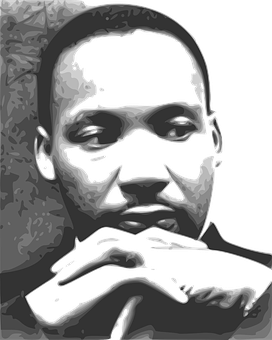 The HHRC also encourages residents to commemorate Martin Luther King, Jr. Day with next year’s annual walk on the evening of Jan. 21, to always appreciate the sacrifices Martin Luther King Jr. made to better society. “Let us move forward into the great new future, and turn the dream that Martin Luther King had for his children into a reality once and for all,” Stone said.